On #GivingTuesday, Castleton University raised nearly $9,000 for student scholarships and set a new Castleton record for most donors on a single day with 184! Our students also contributed to the giving spirit on campus, hosting food and warm winter clothing drives. Our student-athletes collected hats, scarves, and gloves/mittens. 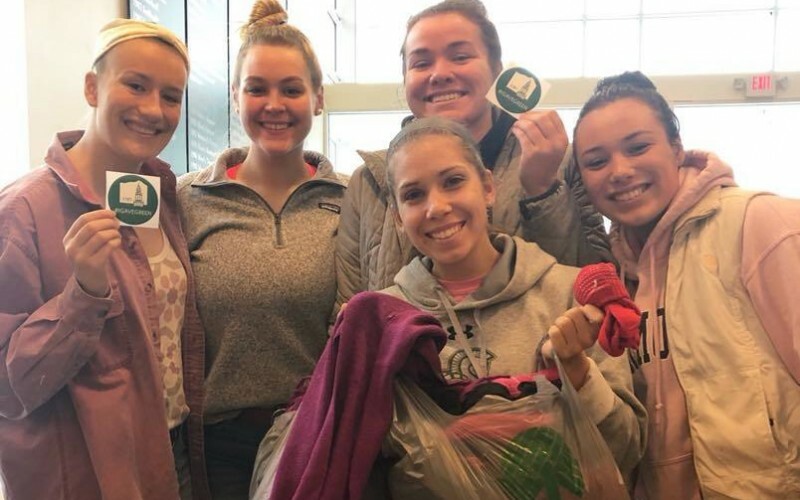 Members of the women's basketball team collected the most items per student throughout the day and all 28 varsity teams participated, collecting nearly 500 items in total. Due to the critically low stocks at local food shelves, the Student Government Association will extend their giving over four days. Students will be accepting donations of non-perishable food and hygiene items, as well as coats, boots, and cold weather gear through November 30 in the Campus Center and Glenbrook Gymnasium from 10 a.m. to 4 p.m. each day. The SGA will award funds to the student clubs with the highest level of participation.